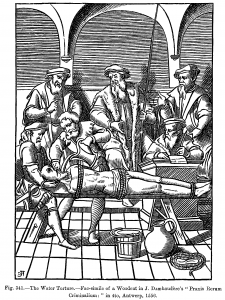 Water torture centuries ago: Wrong then and wrong now. It’s distressing to hear conservatives on cable TV defend the idea that it is ever OK to torture prisoners. The term now is “enhanced interrogation techniques,” but the euphemism is far too vague. It covers everything from keeping prisoners isolated between interrogations to near-drowning or shackling people, naked, to the ceiling for hours at a time. The apologists for the more severe kinds of physical abuse defend it on the grounds that it may have, and perhaps did, save American lives after 9/11. They fail to see this: If it’s OK for us to abuse prisoners to save our countrymen, then it would have been OK for our enemies to abuse captured Americans — such as pilots downed in North Vietnam — to extract intelligence to save their countrymen from more bombing. The apologists also compare the misery and death that war fighting always inflicts on civilians and children, and they ask: If Obama has no problem killing innocents with drone strikes, how can he complain about inflicting discomfort or even pain on suspected or actual terrorists? The difference is intent. Drone attacks don’t intend to kill innocents, though that’s the inevitable result, which is why aerial attacks are morally questionable. But inflicting harm on a helpless captive is in a whole different category of reprehensible conduct. That much should be obvious. In addition, consider this. Based on written evidence from CIA records, the report by the Democrats on the Senate Intelligence Committee concluded that of the 119 individuals held in CIA custody from 2001 to 2009, 39 who were known to have been subjected to the enhanced interrogation program produced no intelligence while in CIA custody. Other detainees did provide “significant, accurate” intelligence before or without being subjected to the techniques. And “multiple” detainees, under duress, provided information that was fabricated. By the way, of the 119 known detainees, at least 26 were wrongfully held. The report does not say whether any of the 26 were mistreated other than being wrongly incarcerated. But if any were, put yourself in their position. These kidnap victims had nothing to tell their interrogators and yet were subject to possible torture if they kept mum. How can anyone justify that? “1. the act of inflicting excruciating pain, as punishment or revenge, as a means of getting a confession or information, or for sheer cruelty. That’s a pretty explicit definition (dictionary.com). Without defending or sponsoring “torture” it’s important to truly define what is and isn’t “torture”. The definition above seems to have morphed into something other than it’s original definition – “excruciating pain”. 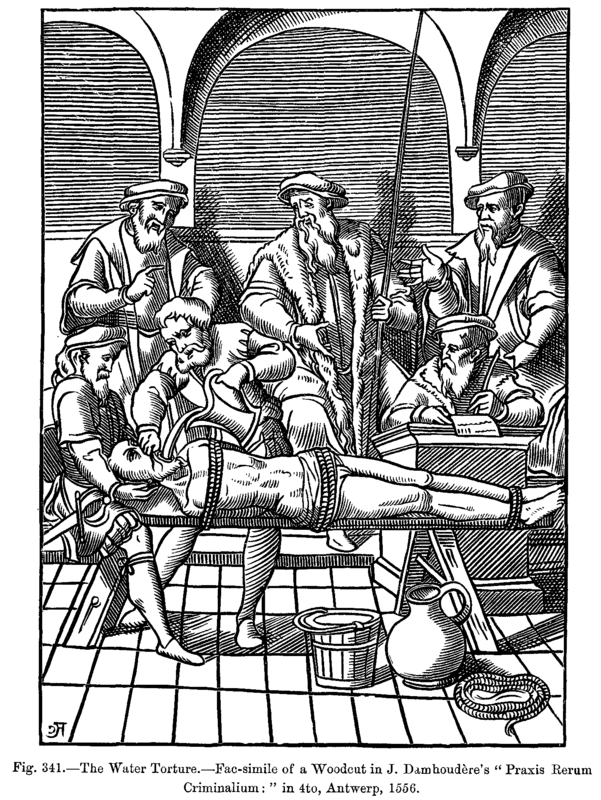 Are we now including extreme discomfort as torture? How about mild discomfort? What about mildly irritating? Where do we draw the line? Contrary to what Hasso has written, there isn’t a huge outcry from conservative pundits rallying around the flagpole of torture. There has however been a concerted effort to clearly define what torture entails and what those limits are. Rather than muddy the waters with ambiguous statements on how conservatives promote and applaud torture, how about we work to clarify exactly what is meant by “excruciating pain” and a clear definition of what true torture entails. So you’re comparing the physical disfigurement McCain received to the discomfort felt at Guantanamo… you’re telling us that torture is no longer defined as “excruciating pain”… torture is now anything that causes discomfort, correct? Since McCain is now the qualified expert on all things torture, perhaps we should notify Webster that their dictionary is wrong? Tell you what, Hasso……I won’t defend torture as long as you don’t defend this “report” by these Senate Democrats, which is a pile of horse dung. The fact is that our legal system is set-up to provide legal cover for decision-makers in many levels of gov’t and businesses. That’s why USAG Holder will not seek to punish anyone in the Bush admin—and I support that. The whiny Dem’s were briefed in detail at the time say many of those who were not interviewed for the partisan report you refer to. This is old stuff and likely to repeat so let it go. I’d like to see waterboarding used when an admitted/convicted serial killer won’t tell where the recent victim is being kept. Stop all the negotiations and plea deals.. The comments here by the recent mayoral candidate, and the self-proclaimed leader of the local anti-government forces, is even more enlightening. They also thoroughly disgusting and reprehensible in their own right. I don’t see where Jim Clausen has proclaimed himself a “leader”. People that can think for themselves don’t NEED leaders! Why are you concerned about who runs for Mayor in Albany when you don’t live here? And Jim Clausen’s last paragraph in his initial post hit the nail on the head and you took the bait.